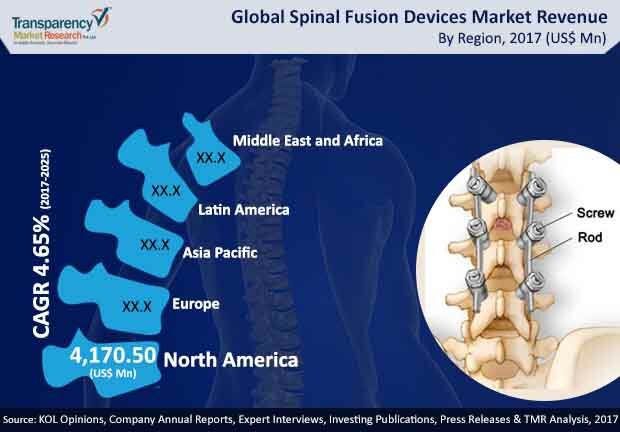 The vendor landscape of the global spinal fusion devices market is dominated by a handful of well-established vendors, thus displaying a largely consolidated nature and hinting at several entry barriers for new or small vendors, observes a recent market research report by Transparency Market Research. Need for excellent technical know-how, funds required to undertake research activities to develop advanced spinal binding products, and the strict guidelines set by authoritative medical bodies globally related to the approval of these critical medical devices make it clear why the market is ruled by a few large-scale international medical device companies. So as to sustain their positions in the overall market, companies are focused on the development of new and more reliable products, expansion across emerging markets with ample growth opportunities, and strategic collaborations with healthcare service providers across emerging economies. Some of the leading companies in the market are Stryker Corporation, Zimmer Biomet Holdings Inc., Titan Spine LLC Medtronic plc, Depuy Synthes, and B. Braun Melsungen AG. According to the report, the market is expected to expand at a promising 4.6% CAGR between 2017 and 2025, rising to a revenue opportunity of US$10,965.7 mn by 2025. Of the key product varieties available in the market, the segment of thoraco-lumbar fixation devices accounted for the dominant share in the overall market in 2016 and the segment is likely to dominate the global market over the forecast period as well. From a geographical perspective, the market in North America presently accounts for the dominant revenue contribution share to the global market and is likely to retain its dominance over the report’s forecast period as well. The regional market is likely to benefit from the well-established healthcare infrastructure and easy availability and high adoption rate of advanced medical devices. Besides the rising prevalence of chronic back pain and back-related issues induced by sedentary lifestyles, which are organically leading to the increased demand for effective cures for these conditions, the increased focus of several leading medical device companies on R&D activities aimed at finding proper cure to these conditions is driving the market. The market is also driven by the rising population of geriatric population, a demographic that is prone to a number of disorders related to the spinal cord. In the past few years, there has been a significant rise in the population of people above the age of 65 years in regions such as North America, Europe, and Asia Pacific. This factor has led to a substantial rise in demand for spinal binding devices. Other macroeconomic factors such as rising disposable incomes and increased level of awareness regarding the available treatment methods for spine-related disorders, especially in developing economies, rise in R&D pursuits, and the steady rise in availability of new and more reliable devices across the globe are also working well for the market. Moreover, the introduction of products developed using innovative plating technologies that provide better stability and structural integrity to these products is also helping the market gain traction. Furthermore, the advent of newer locking mechanisms and screw systems developed from tougher materials such as titanium alloy are boding well for the market.